Before you start your next project, don’t. So I figure it's fair to announce my project now. I don't remember ever making something with my hands besides a birdhouse when I was 10 in school, so this will be interesting. I spent some time teaching myself 3D modeling basics.. and now I just need to put tools to wood! I know I'll need a lot of help, so please feel free to offer advice and constructive criticism! 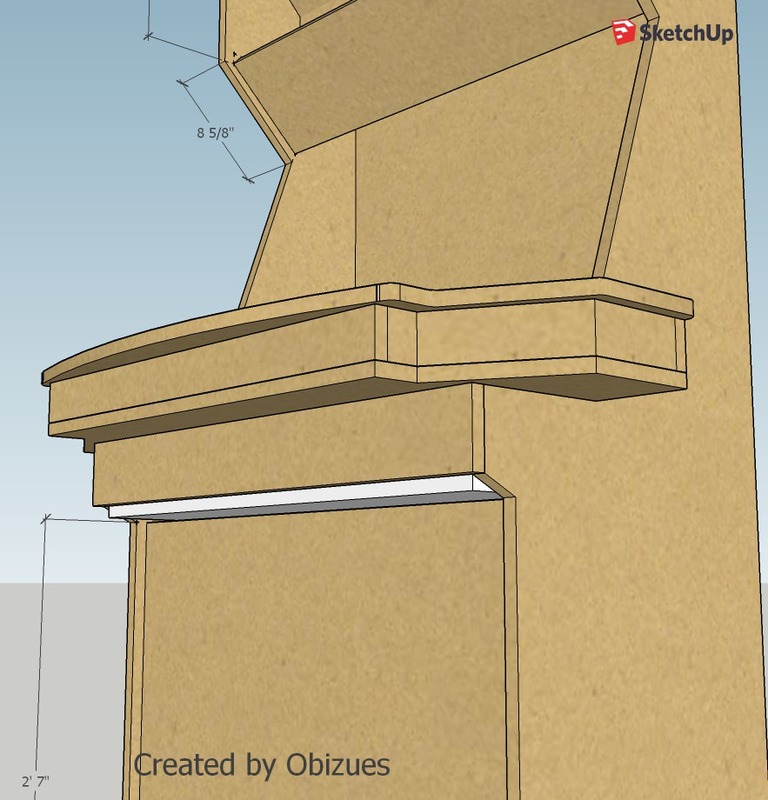 Make all cabinet plans in a 3D modeling program to share with community. Arroyo - So many questions about everything, answered them and helped me a ton! jarrett - Super large control panel layout concept I "borrowed" (read: stole) a lot of info from. Thanks for info! Why are the buttons so low though? Shouldn’t they be up higher? Why are the buttons so low though? Shouldn’t they be up higher? That diagram is only intended to show angled vs. non-angled sticks. Arrange the buttons however you like -- see slagcoin for a variety of layouts. Test the layout and spacing with a cardboard/hardboard control panel mockup FTW. Also the distance/angle of the monitor looks a bit close and upright for a 4 player setup. If you haven't read the FAQ yet, check out What type of build meets my needs? P.S. If you like dual-joystick games like Smash TV or Karate Champ (partial list here), you might want all four sticks in a horizontal line for two-player dual-joystick fun. So I could keep my panel layout, just make sure when I cut the recessed areas for the joysticks the are straight? Yeah, I used slag coin for those spacings. Is there a usually distance you want your sticks or buttons from the monitor? Or are you suggesting I bring out the length of the cp support and angle the screen more? Is there an angle, or best practice for this? I’ve never heard of this but I’ll look into it. Are those unplayavle at an angle? What do people add the extra arcade sticks for in the center area by the master buttons? I’ll add my 2D drawing of my CP so it’s easier to see the measurements as well. Thanks for all the insight!! Most often the are dedicated 4 way sticks for games like Pacman. You could just as easily by switchable sticks. I have Magstick plus' on my cab so all I have to do is pull up and turn to switch between 4 and 8 way. Yes. You can shift the joysticks left/right/up/down as desired as long as they are straight like the green sticks and not turned at an angle like the red stick. I was thinking about the monitor angle/distance on a Gauntlet cab. Before you make sawdust, you might want to make a mockup to check the visibility from P3/P4 point-of-view. Do the sides block the view? If the sticks are positioned like P3 and P1 in the angled sticks diagram, your body will want to turn to the right because it's hard to play with one hand farther away than the other. Not quite sure what you're asking here. Are you thinking about the panels that have a dedicated 4-way stick for Donkey Kong, Pac Man, etc. ? I guess the difference there too is that the arcade CRT is square.. and the play area is very square as well. I think so, what kind of card do people use in order to hook the 4 way stick up? The same i-Pac type thing? If you truly have no idea what you are doing I'd rethink the 4P setup. There are only a handful of games that even support 4 players and they are largely the same game just re-skinned (TMNT, Simpsons, X-men, etc.) or Gauntlet. If those games are must-haves then go for it (keep in mind they are all playable as 2P games). Also think about how often you will actually have 4 people playing at the same time. A couple of times a year when you have friends over? Every day because you have 4 kids? Design for you, not for the once a year dream scenario. The biggest mistake people make is trying to build one cabinet to rule them all when often a focused project will still give you hundreds of great games to play but also be functional and user-friendly. 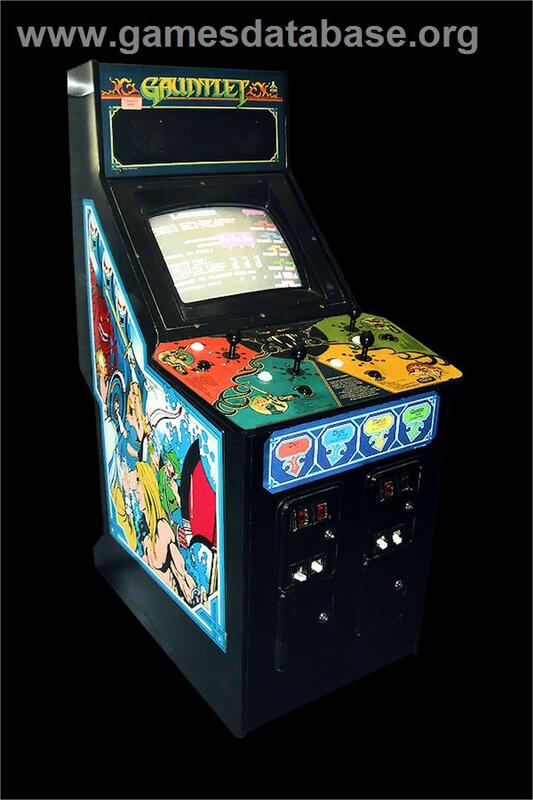 I can't count the number of questions I get almost every time someone comes over to play and my cabs run about 30-50 games max with one set of controls. At the end of the day, do what makes you happy - just trying to offer some additional perspective. If you truly have no idea what you are doing I'd rethink the 4P setup. There are only a handful of games that even support 4 players and they are largely the same game just re-skinned (TMNT, Simpsons, X-men, etc.) or Gauntlet. I understand. I do want to be able to play 4 player games though and while it may only be monthly or bi-monthly- that’s when I’ll be getting the most use out of my cab anyways. Good luck with your build! Toodles! AutoCAD won't help with predicting monitor image quality from various points of view. Depending on the degree of screen incline and how far to the side the outer players are, the display may look washed out. The only way to tell for sure is to look at a typical game displayed on your monitor from the same height, incline and side-angle that you will be looking at it when it is mounted in the cab. You can use whatever encoder(s) you prefer as long as they have enough of the right kind of inputs. See part 5 of the FAQ about Encoders for important considerations when selecting the encoder(s) for your build. You can wire a dedicated 4-way stick in parallel with the P1 8-way stick. Each row of microswitches is a separate stick. When lines cross, a dot = connected and no dot = not connected. Your choice on whether you want to "daisy-chain" each directional input as shown or run a separate input wire from each microswitch to the directional input. Wanted to post out the current draft of my arcade and the current CP look. Feel free to leave comments/feedback. Originally I was going to not release my cabinet's CAD design since it was similar to ChangeKG's model, so I didn't want to steal his IP. I may be reworking the side shapes though to round them out and change it to make it my own in which case I will most likely release the plans. I will be releasing my CP's CAD since it is 100% mine, just highly influenced by jarrett's mock from some time ago. I put in some more time so now I'm even a little closer!! Not sure how to fix the area in white... There is a small gap between the area under it (that I would like to swing open like a cabinet) and the area right above it that I want to have a hinge to swing down to access a keyboard and mouse that will be hooked up to my PC. Any ideas? 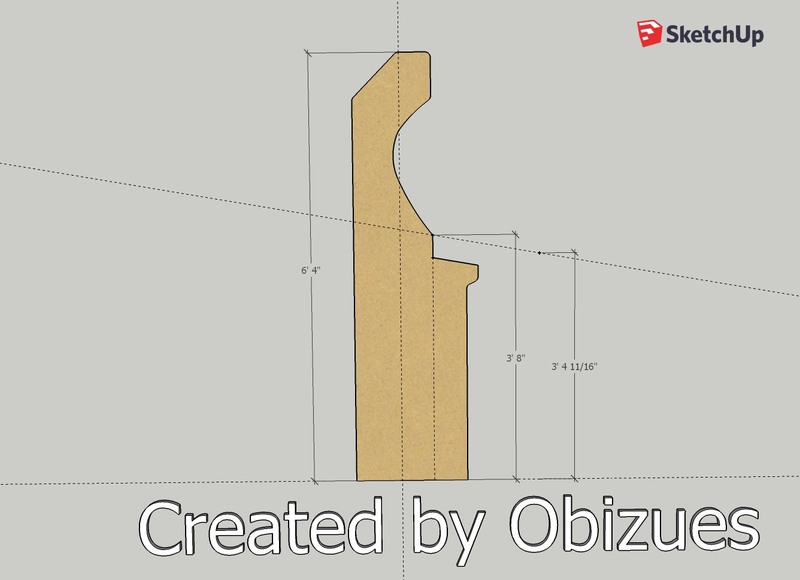 I could slant it upwards.. but I'm not sure if I take a miter and cut the angle if it will work. I guess I could take a hinge and connect it on a slant to the bottom, and then have a latch that connects to hold it up on the upper portion.... but not sure...? I could also just make it longer to close the gap..
"Not sure how to fix the area in white... There is a small gap between the area under it (that I would like to swing open like a cabinet) and the area right above it that I want to have a hinge to swing down to access a keyboard and mouse that will be hooked up to my PC. Any ideas? 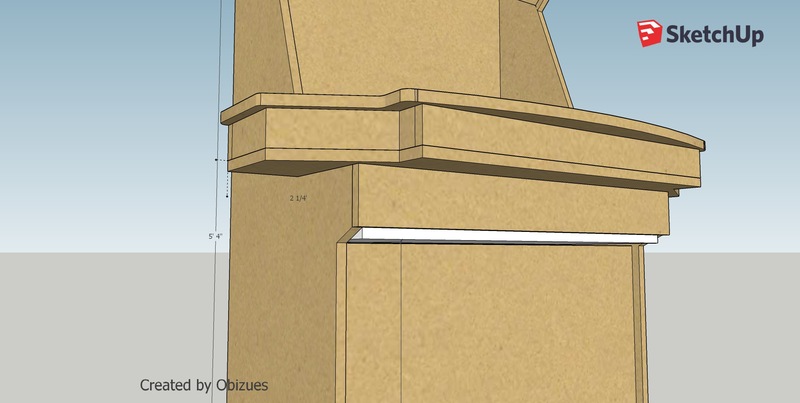 I could slant it upwards.. but I'm not sure if I take a miter and cut the angle if it will work. I guess I could take a hinge and connect it on a slant to the bottom, and then have a latch that connects to hold it up on the upper portion.... but not sure...?" You dont need that much height for mouse + kb. How about if you higher the bottom of that drawer and just close the bottom. So that the bottom sheet of the drawer is higher than the frontpanel of the drawer. Now it shows, then it wouldn show and you can close the slot with woodpiece. I hope you understand what i mean . Wireless keyboard with a track pad. It costs like 11 dollars. 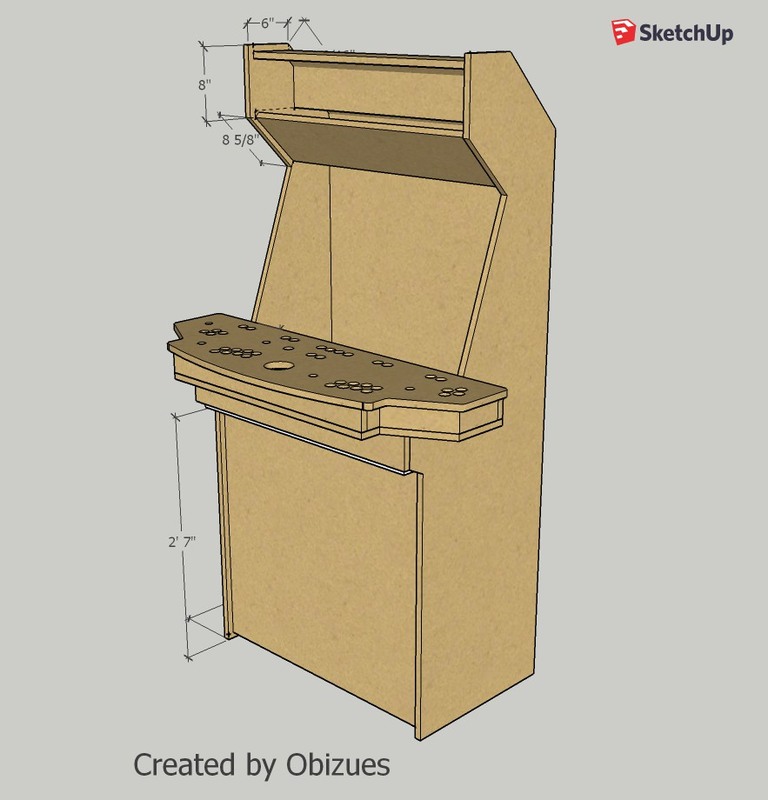 you don't need to store a keyboard and mouse inside your arcade cab. I think I do, bring up the bottom to be parallel with the extruding “arm” of the cab side? I guess I could just shorten that arm cutout and make the bottom a 90 angle and make it flush with the cab. While I understand what you mean (I have a wireless keyboard and mouse), it’s more about having it right there for me. How is opening a door and pulling out a tray more "right there" than a wireless keyboard you can put anywhere? Mike, my friend, just let it go. This dude obviously has a specific plan in mind. Out of curiosity what do you guys do with your wireless keyboards? I end up setting mine on top of another game. It always seems to be in the way. Mine is in my basement because I haven't needed it since the first week my machine was in operation. During that first week of tweaking I just leaned it against the wall behind the cab. I keep a pretty limited list of games on my cabinet. Seems like every time I want to participate in the BYOAC High Score contest I have to break the keyboard out and add a new game. I set up my previous cab with remote desktop. I just used my laptop with wifi to do any maintenance I needed. I was going to do that with this one, but I don't tinker with it enough to be necessary. I rarely (never) need to use it after the cab has been up and running for a week or two. I usually just set up the game list I want and move on. I have a drawer in my basement that I keep the keyboard in just in case but I haven't used it once. At least it doesn't have cup holders... yet. I’ve seen people that have other single games that may not plug into their front end use it, or if they like to do MAME updates/customize controls. It’s just preference. See? This is how it is done. This guy has a sense of humor. Too many people freak out if you don't love their precious ideas. What I think doesn't matter at all if you are happy with the end result. If you aren't happy, it is because you didn't heed my sage advice. You will have to live with that crushing guilt for the rest of your life. I look forward to seeing you finish this project. This is you gateway cab. When you finish it you will be happy. It will be loads of fun. After awhile there will be an annoying little voice in your head. "MikeA is right. ", "build another cab with a sweet CRT". "Fill you house with arcade machines". If my little palm sized Keyboard doesn't cut it, I have another slightly bigger keyboard stashed behind my bar. These days it gets more use as a defensive weapon than with my arcade cab. I just couldn't understand why so many people sacrifice such a big space of real estate front and center in an otherwise beautiful piece of art just for a keyboard. The only time I struggled with this decision was when I wanted to play computer games like C64 & Amiga. But there are ways around that if you work hard enough. A quick question for the OP. 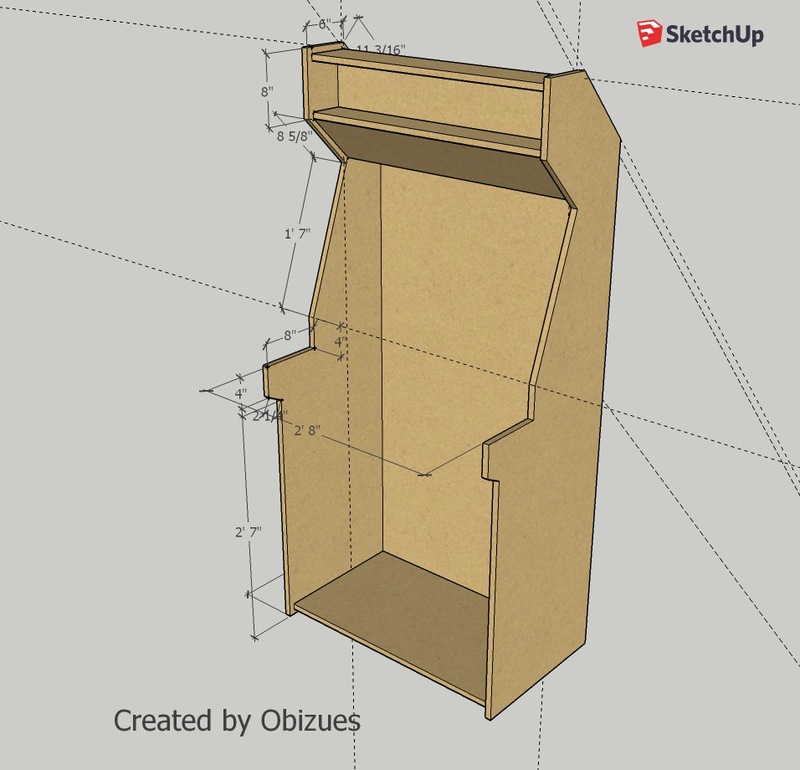 Does the height of the control panel box take into account the height of the joysticks you will be using and where the USB encoders/lighting will go? Have you also thought about how you will access all the button/joystick connections after its built? Very sharp. Is the total height of this cabinet 6'2"? I've seen a range from maybe 5'10" to 6'2" I think. I really appreciate seeing your design with measurements. Helps me immensely in deciding on my own. I just couldn't understand why so many people sacrifice such a big space of real estate front and center in an otherwise beautiful piece of art just for a keyboard. My feelings exactly. My wireless key board is mounted on the back of my cab. Since I got everything configured I only pull it out when my 5 year old wants to play Metal Slug. His little fingers get tired after 5 mins so i have to turn rapid fire on. Long answer is yes, I will be putting a hinge on the CP so it opens upward like a cabinet to access the wiring if I need to again. Right now I have a box that is 2 1/2" to fit all my wiring and button portions of my buttons in, which I may expand by another half an inch to make sure I have enough room, especially for the trackball which takes more room up on the bottom. I should not I am using 3/4" plywood and will be using a CNC much like Chance did, so that's why some parts are so thick. I'm about 6' and I am altering my design right now to be higher (from 3' 4" to 3' 8") so that it's more natural in how I hold the joystick. I also added a slope of 10 degrees downward... so truth be told the end of the control panel will be about 3' 5". Right now my cabinet stands at 6'4"
I haven't updated this thread with my drawings in a while, but this is the current version of the profile pieces. I am still debating if the curve cut is too thin where the screen will be.. but they ARE thin, so I think I'm okay. I'll be updating again once I finalize my full 3D render. In terms of figuring out if your sides are too thin, don't forget to account for the back panel and its thickness and enough space for wires, glass and the bezel. The angle of your sides means you will have a bottom marquee that has a lot of dead space in it (unless you plan on putting large speakers in it).